Heading west out of the Denver area on US285 we see only tinges of fall colors –hints of things to come. About five miles east of Bailey we begin to see groupings of small aspen dressed in their autumnal gold. West of Bailey we note that some of the willows along the river banks seem to be shedding their foliage without reaching peak color, their leaves a dull ochre. 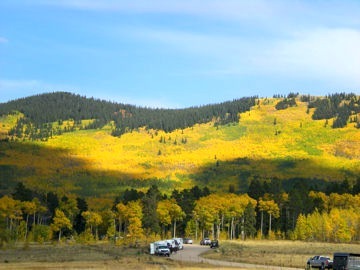 As we ascend Kenosha Pass color intensifies, especially the last four miles to the summit. Thick dark storm clouds are gathering to the north so the light isn’t ideal but the large number of aspen near the top of the pass have mostly transform to a wave of yellow. Color worth the drive. 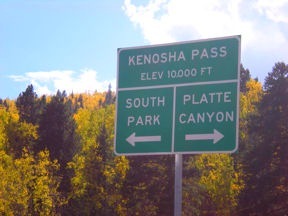 The Colorado Trail crosses the highway at this location, very popular with hikers, mountain bikers and horseback riders. Crossing South Park towards Fairplay the grasses and scrubs give off as much color as the aspen. The thick aspen groves on the slopes east of Red Hill Pass have just begun their transformation. Good color around Fairplay, however as US285 turns southward the trees on the eastern side of the Mosquito Range are still in summer green. Trout Creek Pass and the remaining miles into Buena Vista sport only a smattering of aspen. ***Road Delay Alert – US285/24 between Antero Junction and Johnson Village is in the final stages of being resurfaced. Signs say, “Expect 15-minute delay;” and, we did wait about 20 for our turn along a one-lane stretch. The project has only a few segments remaining but for the next few days you may have to wait patiently.